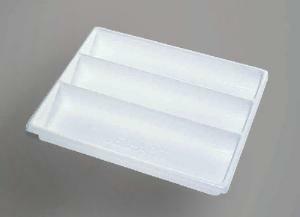 Polystyrene organizer is perfect for storing and organizing small laboratory supplies. Now your pipets, thermometers, and other long, breakable items have a safe storage spot. Three plastic compartments, two 4" x 16" and one 5 1/2" x 16", keep instruments flat and separated. Overall size: 17"L x 14"W x 2 1/2"D.